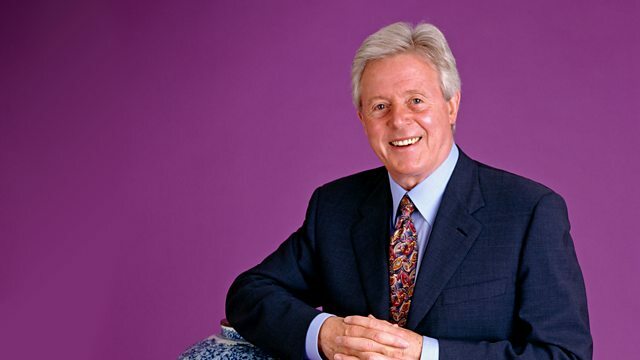 Michael Aspel presents an edition from Boston, Lincolnshire. Interesting finds include a valuable dining table and a Chinese fertility figure rescued from a shipwreck. Browse content similar to Boston. Check below for episodes and series from the same categories and more! We've taken a trip to Boston. went off and helped to found a new continent. its name taken from a 6th-century missionary, St Botolph. and the hamlet soon became the outport for Lincolnshire. By the 14th century, it was the fourth richest provincial town. Merchants from all over Europe flocked to the Great Fair held on St Botolph's Day every June. All that was needed was a symbol to celebrate its new power and wealth. St Botolph's is believed to be the largest parish church in England. probably because the steeple has the appearance of a tree with its boughs lopped, ready for felling. under the parson's nose - if you see what I mean. And how's this for light relief? Some wonderful carving, dating back to about 1390. Boston's fortunes as a trading port were fading. personified in 1612 by the new vicar, John Cotton. to dismantle its elaborate structure and sermons and return to a simpler, purer form of worship. There was a price to pay for rebellion. set sail from Plymouth in 1620 aboard the Mayflower. They were bound for the New World and religious freedom. and in 1630, members of the congregation sailed on the Arbella, bound for Massachusetts. There they founded the new Boston. at the Peter Paine Sports Centre. Well, fantastic African art apart, what happened? -I broke my neck and fractured my skull and cheekbone. Anyway, we're here to talk about your collection of African art. West African, Nigerian and Yoruba twin figures. Where did they come from? and collected them while he was there in that area. rather than sold on to tourists, or carved for tourists. This pair are rather nicely worn, which shows that they've been used. -Do you know why these figures were actually made? the woodcarver of the village and would have these figures made. but they would offer food and drink and all that sort of thing to them. This is probably 20th century. particularly on the big figure. Do you have a favourite? I like this one. I like all the markings on the body. The scarifications on the body. and the blue colouring on the hair, and the beading, of course, which is absolutely tremendous. I have a particular pair here which I think are rather splendid. would be worth somewhere in the region of £600 to £800. we have a table full of it, so where do you think we're going as far as price is concerned on this? -Well, I would have thought you've got the best part of £5,000-worth here. is at Mapledurham in Oxfordshire, at that house, but other than that, I know nothing about it. because that makes it sound rather brutal. They're known as deportment chairs. if you sat on this, with its very straight high back, and you weren't sitting up properly, you'd tip off. in any way other than in a perfect posture, upright. -because of this decoration on the top. and it's a country piece, because it's made of beech. because they're a good size to display things on. -I think it would probably be worth insuring it for about £350. Six of the figures from Lord Of The Rings, made by the Doulton factory. and then the rest were presents from my mother-in-law for Christmas and birthday. Do you remember how much he cost? -I remember this one cost my mother-in-law £20. and they weren't limited editions. There were actually nine of them. You haven't got the other three? -but they're zooming up in price. and nowadays you have to pay a lot of money for these things. -they would fetch something like around about £1,500. -Much more than they did a year ago. -I suppose one's still looking at something like about £750. Do you have an Irish connection? No, I don't. I did try and find out the origins of the chairs after I purchased them. -Yes, they're a pair. They were very distressed. that there had been a chap who'd been buying furniture in Ireland and retailing it in this country. And, I mean... this upholstery, YOU put on? -Were there layers of upholstery underneath? -..with foam rubber and red Dralon. -Lovely(!) Good for fire risk too! but the real thing that stands these chairs apart from almost any others are these distinctive legs. -They're made of walnut rather than being mahogany. and that was on a suite of Irish chairs, Irish side chairs. -They're thinner and they were in mahogany, not in walnut. you can never see whether it's a 20C copy or an 18C one. The form itself is not a form you would see in the 18th century. -the whole proportions of it, is a different shape to any 18th-century prototype. there's a good amount of wear actually on the feet themselves. 20th-century chairs, but they're not 18th-century chairs either. You bought them as being...? I suppose either sort of late Victorian or Edwardian repros. in terms of construction, I think they date from the mid to the second half of the 19C. Characteristically Irish on the bottom. How much did you pay for them in their distressed state? -So am I! Thank you. -..bad breasts and gatherings of all kinds. One and a ha'penny... One shilling and one ha'penny per pot. -As toucans go, this is impressive. Michael, you remember these, don't you? I remember the film with Glenda Jackson - Only Two Can Play. That was excellent. -One of the most famous advertising symbols, isn't it? -And there was the other one... "My goodness, my Guinness." Where the boy's lost his glass down an ostrich's neck. It's fabulous. -Did it stand on the bar? -Yes, as an advertising symbol. -And it would have had a glass of Guinness on the back? Rough evening in the pub, perhaps. The glass has gone, as you can see. So, ruby and diamond cufflinks in the form of owl's heads. -I didn't know they were ruby and diamond, to start with. -That's a good start then, isn't it? We want to know who they belong to. I bought them for my husband as a birthday present. and I guess they date from about 1910, something like that. and very desirable, and I'm going to value them at £1,250. -I think I deserve brownie points for years! -Do you drink tea out of this? -No, it's in a display cabinet. -I heard the word "teatime". You've come all the way from China? -It is a lump of compressed tea. -and I bought one for my daughter. Sorry I interrupted. -I thought it was a coincidence. -The perfect moment! You haven't got the cream? -We'll grind it up, make tea. Actually, they made those for the Russian market. and this is for leaf tea. You call it a service, but is it really? -but the patterns are slightly different on some of the items. The odd one out is actually the teapot. albeit of different patterns, but this is made of earthenware. If you hold this up to the light, you will not see light through it. It is earthenware. Let's do that. You see? Nothing coming through at all. that is actually imitating contemporary porcelain. Staffordshire, Yorkshire - they all produced this pearlware. I do like that swan on top. Isn't that pretty? maybe anything up to £200. And it was given to him about 55-60 years ago, all in tiny little pieces. -Yes, it is like a jigsaw. -..Which says H Hughes, 1870. Of course, stained glass is a long tradition in English art. It goes back to the Middle Ages. usually in a sort of enamel. -and Burne-Jones their most famous designer. but he obviously, clearly, was a first-rate artist. Now, what about the subject? I see here it says "Black Prince". -the French arms and the English. -or laid claim to, large parts of France. But tell me, where do you have it in your house? -and entrance hall to take it. -So it's on an inside wall? -Does the light come through it? The whole essence of stained glass is you've got to have light coming through. but not many people collect stained glass. It's a minority activity. I would think, without question. -It was bought locally in a small cycle shop owned by a German gentleman in Boston. -How nice. Well, it's a fantastic piece. and that started the movement which revolved the disc. -That was quite a lot of money then. -Well, my suggestion is today, you insure it for about £3,000. I didn't know how much it was worth. It's just a treasure. Love it. -You keep it, but do insure it. This is truly a whopper. How did it come into your life? We didn't realise it was as big as this when we bought it. We bid for it on an auction site. we both fell in love with it. -Did you have the full dimensions? where you don't realise how big it actually is when you measure it. -We paid... This is the secret of bidding. We actually paid £300 and a penny! -We actually won it by a penny. -And did the price include delivery? -No, it was about £50 for delivery. -So you spent about £350. And a penny, yeah. And a penny. -And what do you actually know about it? -Well, we know that it's oak. We was told that it was Flemish. And, er, basically, that's about it. and that with that sort of specialist appeal, you could get at auction between £500 and £800. That's OK. Not a bad profit, is it? -So that's one for the internet. My dad was at the 1936 Olympics and he brought this back. -"at Olympiad, Berlin, 1936..." He was there? to show off the power and physical prowess of the Third Reich. -So these are the signatures of the American baseball team? But it wasn't an official Olympic sport, was it? -No. It was a demonstration game. -Right, that all makes sense. There's going to be a huge interest from the US in this. It's a difficult one to value. I've never seen one. -it's potentially worth at least £2,000 or £3,000. -The sky's the limit. It's a unique item. -What a great little chap. I like the, er, bottom bits. -This is a fertility figure, I suppose. -It is a fertility figure. -From the Tek Sing ship's cargo. -Which has been fairly recently discovered. -Have you got much stuff from the Tek Sing cargo? -How did you get hold of it? -Well, my husband worked for Mr Hatcher. Mr Hatcher's uncle did the deep-sea diving and found all the pottery. -He asked me to go deep-sea diving with him. and one of the most valuable things on that Tek Sing cargo. -These fetch hundreds of pounds. -Dealers ask, some of them, almost £1,000 for one of these. -So you've been very fortunate. -I think he's wonderful. Yes, he is. -because they're used. This has seen some good use. Well, since I've had it, yes, but previous to that, grandparents. -Oh, so you've known it in the family for...? and they make them beautifully, very, very good timber, copying the same designs exactly. -What date do you think this table is? -Haven't a clue. I just thought it was reproduction. There's a few good giveaways. One always looks for the construction on the underside. The top can be repolished and refinished. one of the things I always like to look for is the catch itself. This is a very nice traditional design of catch. Can you see where the light catches bits of old lacquer on the brass? It's a wonderful finishing technique which most reproduction dining tables don't have. -That is a very nice Georgian catch. these end sections and the central pedestal should mark the top. You've got corresponding wear here. -I wondered what that was. -When it's down there, it's pushing through. this piece lifts up and stands a little bit proud of the platform. Let's have a look at the base. have scraped along, so you've lost some of the definition that's raised here. made of pine in three sections, is exactly as one would like to see. These are all promising signs of its being an antique dining table. I hadn't noticed the sandwiching. -These, however, are not so good. Those would suggest that this is not a period dining table if you're looking at those alone. -The good news for you is that these are not the original supports. -and shadow marks for longer bearers which originally went here. and then let's see how it goes. but the colour of the top has been taken back. That was in our attic for a long time and those two have been used. -Right, because there's a slight colour difference. -It's had a lot of use over the years, has it? In fact, we used to put the table tennis net across here and play table tennis round it. -Oh, my goodness! Slightly more difficult with a rounded one. -Because they're such good plinths. you have brought in a table full of fakes. -How do you know they're fakes? -It's largely down to experience. You have to know where certain pieces were marked at a particular period in time. In the 18C, they marked particular objects in a particular way. so you're limited to what you can and can't do to a piece of silver. So a fake is something that has contravened that? Yes, that's the short answer to it. is that you cannot change an object from the original purpose for which it was hallmarked. does it strike you as being reminiscent of anything else? -Well, that's exactly what it is, yes. and they've stuck marks on it to show that it has had additions. but as this piece was from the first year that this law came in, 1844, I think we can let them off. But that was transformed from a tankard into a coffee pot. I should just add that decoration - and this decoration is also about 1844 - is not illegal. -if you don't change the use of it. -are people liable for prison sentences, fines? was a very common punishment for repeating offenders. -There's nothing new in this particular crime? -Fakes have been going on for centuries. a wonderful form of consumer protection going back 700 years. Have any of these pieces got a very dramatic history? is part of one of the most famous fraud cases ever to come to light. with all the fake punches. and it actually was made round about 1895-1898. -So, by being so greedy, they helped the cause of justice. This is the most extraordinary illustrated diary I've seen. It's over three years and each page is covered with these most extraordinary drawings. -because a gentleman hadn't enough money to pay. -How much was the debt? including some little gremlins drinking pop or something. but nevertheless they're very much to the point. This one here gives me a slight clue that it's not English. You don't know where it came from at all? -A slight clue is this is called A Temperance Lecture. but I think they're more likely to have had big temperance time in America. Look, this is quite extraordinary. "Melting brass burnt through the patty pan." And here he is, and this tie is very un-English, don't you think? -I mean it IS in English. and the other thing which backs this up is this wonderful list here, in the back. "There are 26 states which consists the Northern, Middle and Southern states." This is all America. and the territories, "Wisconsin, Iona, Florida..."
Iona? Iowa, sorry! I can't read his writing. "..and Columbia District." But that's absolutely lovely. but essentially it is just a delight. Well, I think we'll go for £5,000. -I hope the debt is now repaid! It belonged to my husband's family. My husband's lived in the farmhouse for as long as we can remember. My husband found it when he was a little boy up in the attic. From what we can gather, it belonged to a family member. and here around the title is "Holland Cavalry". they had what was called a tarlatan helmet which the officers wore, and the troopers. but you very rarely get other ranks' helmets. Now it wouldn't surprise me if this is prior tarlatan. -Now, we're talking about 1795 now. nearly 22 years of war, but these early helmets, they just do not exist. -about £4,000-5,000 for a helmet like this. This is a tiny, tiny, little ring. What prompted you to bring it? -Well, because I believe it's valuable. -What made you think that? -Well, it says Lalique inside. -What do you know about Lalique? -Yes, glass later on, yeah. -Well, that's where we realised it could be valuable. -but it's a very beautiful thing, isn't it? -Who gave it to you? We looked after him. He was left on his own, we looked after him and so on. He was 94 years old. -And did he know about...? -I don't really know, no. -I don't think he realised the value of it. and it's made by one of the towering geniuses of the Art Nouveau Movement, Rene Lalique. and this is a tiny expression of his work, but it's all there. -Now, what do you think about this green material? which we call plique-a-jour enamel which means "applied to the day." That's a way of saying that it's an enamel without a background. Lalique was returning to nature. -His inspiration comes from plant life and animal life. and it gives a little bit of naturalism, more than a little bit. -Now the reason it's tiny is that it's a ring. So this is not marks against it that it is a tiny work of art. ..I think maybe £5,000-6,000 wouldn't be completely mad. I'm not generally in favour of flowery porcelain. It's not my taste, and pink roses...eugh! and in-your-face that it just kind of works. And this absolutely works for me. -I do, I mean, it's always been in the cupboard at home. but yes, I do, yeah. suggests that you thought it might be of some merit. It was handed down from Great Aunt Lucy in Nottingham to my mother. And she always valued it, I think, because of Great Aunt Lucy. -Absolutely, but you weren't allowed to play with it? -D'you know where it comes from? And we've got on here a typical Derby puce mark. Puce is this particular pinky colour. Now the puce mark ran up till 1800 and then it changed to a red mark. that's where we're at, we're on the year 1800.
although I will give you permission when you get home to play with it for 5 minutes, very carefully! Dare I now? I just don't know. Now, how are we going to value this? It is without a teapot. -I do... I'm sure I have a teapot. OK, let's price it individually. You would get £150 to £200 for the slop bowl. so we're looking at perhaps £250, £300, £400 for the plates. The jug, we've got a bit of misfiring on... No, it's dirt. -Don't draw attention to it! -It could all do with a slight clean. we're looking about £400 to £600. -We're looking at somewhere around £4,000 to £6,000. I just can't believe it, I really can't. It's a good job I wasn't allowed to play with it. It's terrible. See if you can find the pot. -If you can find the pot, another £3,000. I'll find the pot. I'll find the pot! home to the tallest working windmill and the largest parish church in the land. And now I'm going to look for the deepest cup of tea! Thanks to all the Bostonians for bringing us a wide range of items. You can find out more about silver from our website, but now from Lincolnshire, goodbye. Michael Aspel presents an edition from Boston, Lincolnshire, where the founders of the Massachussetts city originated. Interesting finds include a dining table valued at £25,000 formerly used for table tennis, a Chinese fertility figure rescued from a shipwreck and a baseball from the 1936 Olympics.